Understanding your body is the first step to a healthier you. 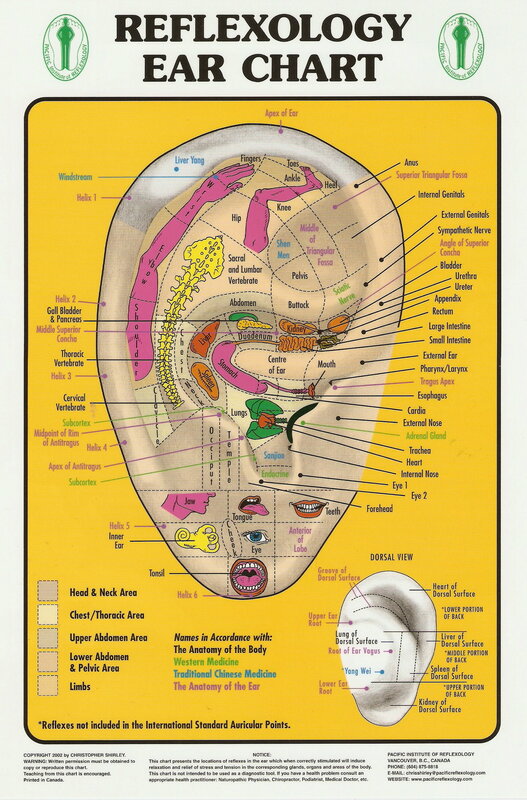 Review the charts below and learn how every part of the body connect to another part of the body. The eyes are said to be the windowpanes to the body. Notice each part and where it is to be found. Now look and see if you see any colors, lines, spots, in this areas. These charts are just a guide, so much more can be found on the net. This is just to get you to understand better how to recognize a potential ailment before it becomes an acute problem. Massage is the best therapy you can give your body. Remember if you take care of your body, your body will take care of you. Please note the chart on the feet, see how all the body parts are reflected here as well. Notice that when a part of the body is ill, then the body part related on the feet will also be sore or tender. Massage this area and watch the illness go away or at least ease up. Whether you suffer from asthma, hip pain (EverydayHealth) or tinnitus, you will find that addressing the corresponding area on your foot will have a positive effect. Regular massages are beneficial to your complete well-being. REFLEXOLOGY is a science that deals with the principle that there are reflex areas in the feet and hands which correspond to all of the glands, organs and parts of the body. Stimulating these reflexes properly can help many health problems in a natural way, a type of preventative maintenance. Congestion or tension in any part of the foot is held in the bone, soft tissue and fluids. By applying pressure to reflex points located in the feet (in some case the hands) crystalline deposits and tension can be dispersed relating to corresponding body tissues. The musculo-skeletal system relaxes, organs and glands are stimulated, and the blood and lymph circulation are improved so that released toxins can be eliminated, thus encouraging the body to heal itself. Reflexology can help you to cope with stress on a physical, mental and emotional level. Energy is cleared from body tissues enabling the release of “negative energy”. Physical toxins and mental and emotional energy held in the body’s tissues can therefore be cleared. It works to restore health to the entire being. Anyone can benefit from the clearing brought about by a Reflexology treatment. FEET ARE THE MOST IMPORTANT PART OF THE BODY. MASSAGE HERE DAILY AND FIND ILLNESS STAYS AWAY. HANDS ARE IMPORTANT LIKE YOUR FEET, MASSAGE AND WARM SOAKS DAILY AND SEE HOW MUCH BETTER YOU SLEEP AND FEEL. The Reflexology Association of America has been serving the needs of its members since 1995 when forward thinking leaders came together to form a non-profit member association dedicated to unifying all reflexologists for the recognition, excellence and professional strength of Reflexology. We are a diverse population of Reflexology Professionals with integrity, honesty and dignity. We endorse professional standards and ethics. We are well educated in our profession and insist on excellence in our field. We are service oriented and dedicated to providing accurate, reliable information to the public. We believe that Reflexology is a non-invasive integrative complementary therapy that benefits all. We believe Reflexology is a stand alone profession and should remain separate from control by any other profession or group. RAA membership is voluntary and open to all professional reflexologists, Reflexology schools, students, and others who wish to support the growth of Reflexology in America.